According to the American Academy of Pediatric Dentistry, a child should ideally by their first birthday. Because early dental appointments are one of the best things you can do to ensure your child’s long-term oral health. When you bring your little one to Ridgepointe Dental, your dentist will examine their mouth to make sure their teeth are developing correctly as well as look out for common dental problems like tooth decay and cavities. Treatment for any issue at a young age is usually simpler and easier than waiting till later, so with early intervention, we can often save your child from needing more involved (and potentially expensive) treatments down the road. 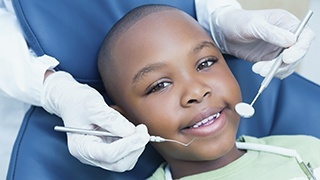 Plus, these early visits will present the perfect opportunity for us to introduce your child to the dental office and teach them about taking care of their new smile. Their dentist can discuss how to brush, why it’s important, as well as how their diet impacts the teeth. Our team simply loves having children around the office, and we have just the right combination of treatments, patience, and a gentle touch to make sure they always have a good time with us. To schedule your little one’s next appointment, please contact us today.